Harry Belafonte is not just one of the greatest entertainers of our time; he has led one of the great American lives of the last century. Sing Your Song lets us share in the struggles, the tragedies, and, most of all, the inspiring triumphs of this extraordinary icon. 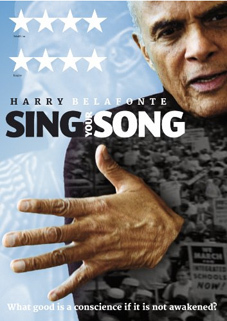 Sing Your Song is an inspiring story of performance and protest, from a superstar singer and actor who was on the front lines of practically every progressive political battle in modern memory. Along the way he became close to some of the most talented and influential people of the latter half of the 20th Century – from fellow students at his acting class Tony Curtis, Marlon Brando, Sidney Poitier and Walter Matthau, to Eleanor Roosevelt, James Baldwin, Bob Dylan, Fidel Castro, Miriam Makeba, John F Kennedy and Nelson Mandela. But it was his intimate relationship with civil rights hero, Dr Martin Luther King, that was to be the most significant of his long political life. Because of his beliefs, Belafonte drew unwarranted invasions by the FBI into both his personal life and career, which led to years of struggle. But an indomitable sense of optimism motivates his path even today as he continues to ask, at 85, "What do we do now?" Belafonte has touched countless lives, both as an artist and an activist and Sing Your Song is a rare opportunity to share his story. Described by The Guardian as "A deeply respectful look at the extraordinary life of Harry 'Day-O' Belafonte," and The Express as "a fascinating portrait of a man who has always had the courage of his convictions," Susanne Rostock's inspiring biographical documentary Sing Your Song will be released on UK DVD on 24th September 2012 by Verve Pictures at the RRP of £15.99. The press release says nothing about a simultaneous Blu-ray release, but you'll find one promised on Amazon and the like, with an estimated RRP of £19.99.